Ardour groups your work in Sessions. A Session is a group of Tracks which eventually may be mixed down into a single Mono, Stereo or multi-channel sound file. Sessions are essentially projects; all your data is saved in a single Session folder. When you start Ardour, you are asked if you want to start a new Session or open an existing one. When creating a new Session you must choose a name for it. You also need to tell Ardour where you would like the Session folder to be stored. When you are ready, click 'New'. Ardour will create the new Session and then open it. The Sample Rate (the number of audio samples recorded in one second) of the new Session will be the Sample Rate at which JACK is currently running. 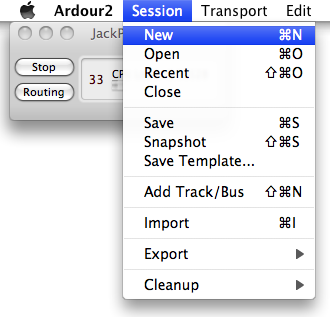 Ardour only allows you to open a Session created at the current JACK Sample Rate. For example, a Session created when JACK was running at 96 kHz will not open if JACK is currently running at 48 kHz. Whether or not to create a Master Bus (i.e. the final audio output of the session), and how many channels it will have. 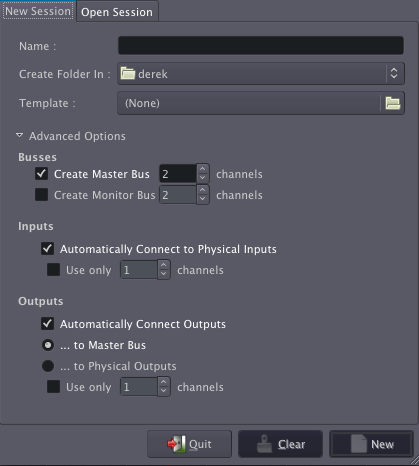 Whether or not to create a Monitor Bus, and how many channels it will have. Whether or not to automatically connect inputs from the computer's audio interface (the sound card) to Tracks in the session, and how many channels to use. Whether or not to automatically connect outputs to either Master Bus or outputs of the audio interface, and how many channels to use. 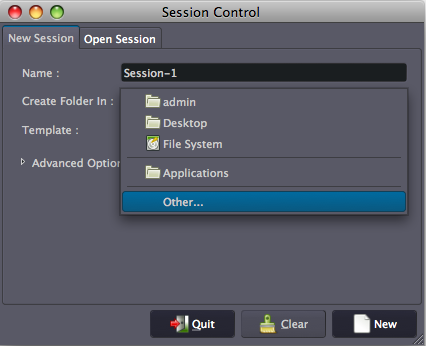 To create an Ardour session after Ardour has already started, select Session > New in the menu. Once you've started a Session, you will most likely want to learn about Setting Up the Timeline to match the kind of musical meter or other timeframe which you will use. Please continue to the next chapter.